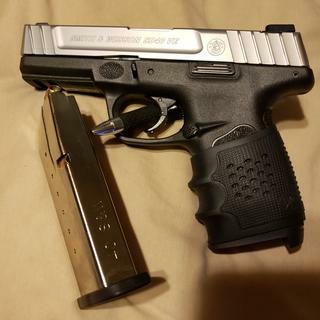 I like all the products of smith and wesson, good quality and beautiful.. It's Ideal for me for self protection and the cost. Not to mention it has good stopping power. Really nice handguns for the great price! I picked mine up about 4 years ago. Had a couple stovepipes in the first 200 rounds. And one double feed. Pretty sure the double feed was operator error. Cleaned it, polished the feed ram and have had no problems with it since. At about 1000 rounds at the moment and it is still in great shape. Trigger is heavy and takes practice to keep it from dragging right. You can get a lighter trigger and upgrades, if you would like, but it is fine the way it is. It was my edc for 2 years. Excellent gun, pulled a bit left out of the box, but that was an easy adjustment. Put about 100 rounds through it (Sig Sauer 40 cal). No issues to report!! Awesome again. My go to gun site. Great gun. I only have about 200 rounds through it so far but it runs smooth and eats anything you load up. Definitely recommended. Great gun i wouldn't recommend aluminum bullets tho. Installing the Apex Tactical Specialties S&W SD Spring Kit, also sold by grabagun, will greatly enhance the 'shootability' of this pistol, just like the 9 mm. Excellent piece. Grabagun good people! I AM SO HAPPY THAT I PURCHASED THIS GUN FROM GAB FOR A GREAT PRICE. I LOVE THE TWO TONE LOOK AND THE FIT AND FINISH. IT IS CERTAINLY THE EXPECTED S&W QUALITY. 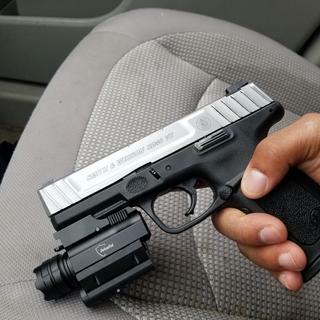 IT FEELS GREAT IN THE HAND AND THE 14 ROUND CAPACITY WITH ONE IN THE PIPE IS TERRIFFIC. THE SELF DEFENSE TRIGGER FEELS PLASTICALLY AND A LITTLE HEAVY, BUT I WOULD NOT CHANGE A THING. AFTER FIRING MANY ROUNDS WITHOUT ANY TYPE OF FAILURE, THE TRIGGER HAS SMOOTHED OUT. 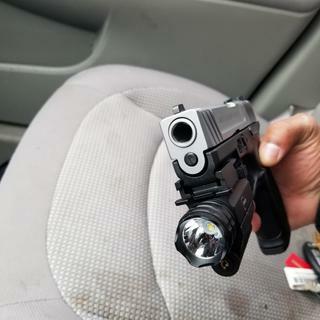 IT WILL NEVER BE LIKE A GLOCK TRIGGER, BUT THE COMPLAINTS ABOUT THE TRIGGER ARE REDICULOUS SINCE IT CAN BE FIRED COMPETENTLY, EASILY AND ACCURATELY IN A SELF DEFENSE SITUATION. I OWN GLOCKS, BUT I LIKE THIS TRIGGER BETTER WHEN I CARRY. IF I WANTED A DIFFERENT TRIGGER, I WOULD JUST BUY A DIFFERENT GUN. I HIGHLY RECOMMEND THIS GUN, ESPECIALLY FOR THOSE SEEKING TO MAKE THEIR FIRST GUN PURCHASE. IT IS SIMILIAR TO A GLOCK 19, BUT AT HALF THE PRICE. YOU CANNOT GO WRONG WITH THIS GUN AT THE GAG PRICE. I LOVE THIS GUN. Great gun. Ran 50 FMjJ's thru the the pistol. And twelve hollow points. There were no issues with the ammo. The Smith and Wesson was easy to field strip and clean. Grab-A-Gun gave me great service on a issue with the purchase. The price,$290, was best price that I have seen. I bought this at a gun show. Got home and GAG had it for less. This is a very under rated gun. Accurate. Fires all types of ammo. And is light to boot. I like it better than some glocks I have had. This gun you cannot beat the price for what you get! Shoots str8 and no problems with her. Its my first double stack. I did install a trigger spring kit to get heavy trigger pull down. I have had this gun for 4 months now. I have shot it several times without a problem with the gun. The gun is very accurate and light enough to enjoy shooting several hundred rounds at a time. Would have given 5 stars on quality but my front sight white dot fell out about 3 months in and did not want to send back to S&W just for replacement. Used some gloss white paint and made new dot. Ordered just a couple of days ago and picked it up at my FFL yesterday. Feels great. Looks great. Seems built very well. Now if only I can find ammo for it. Highly recommend it when it comes back in stock and these guys are excellent to do business with. Just wish knew when it will be back in stock. This is a classic design sidearm with all the very latest design features of state of the art modern weapons. The SD40VE is a full size auto, designed to deliver a .40 S&W round and also designed as a top of the line competition weapon. This is the new design benchmark in personal firearms for ultra-portables, sleek, businesslike, and elegant. If youre looking for a high quality auto with a great design pedigree and top of the line technology, combined with high performance, the SD40VE is a natural choice.